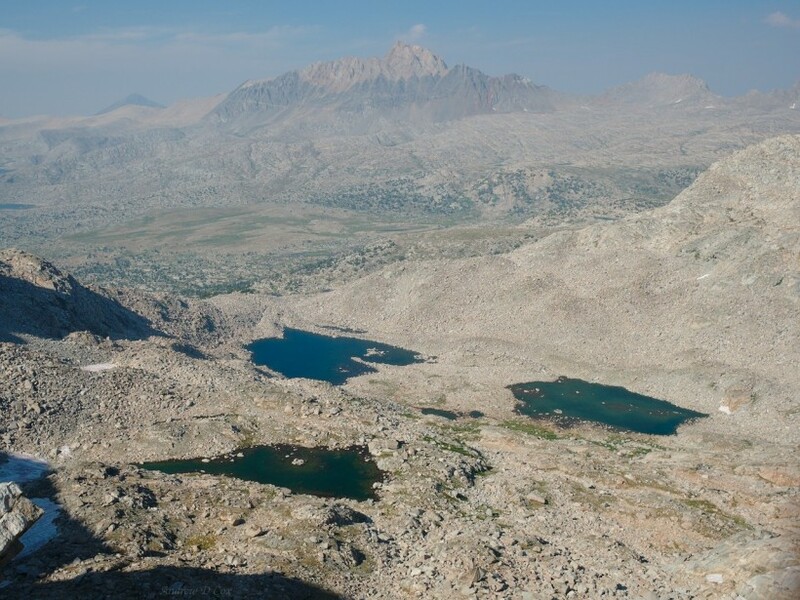 This post roughly covers the second Sierra High Route section which Roper names “Whitebark Country”; additional posts detail my journey along the rest of the high route. 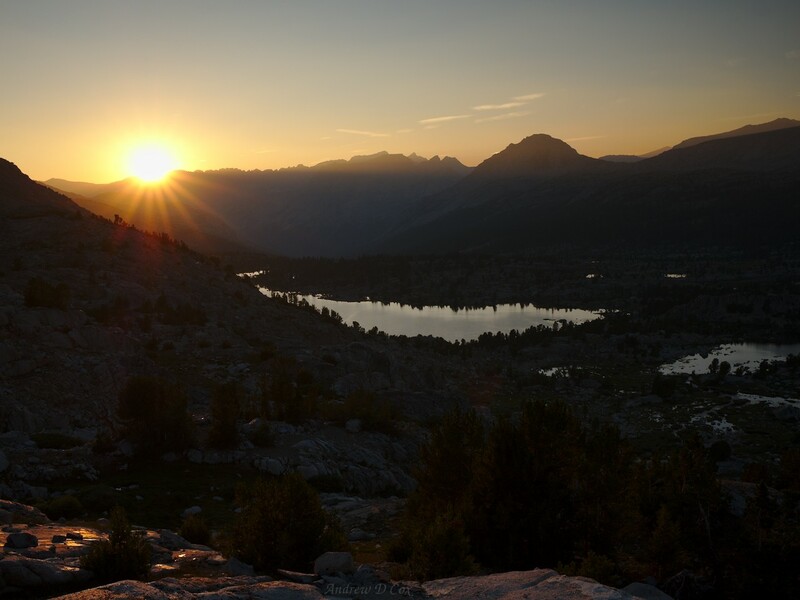 These few days are part of a longer hike along the Sierra High Route. See Cirque (2) for the beginning of the trip, complete with the trip planning details. After a good, long night’s sleep, I wake up feeling refreshed and ready to continue hiking. It hardly rained at all (on me personally) yesterday, and I’m excited by the idea that the rainy afternoons are behind me. It will be easier to finish this trip on time if I don’t have to wait out thunderstorms every day. I pack up camp, eat some breakfast, and then hit the trail. 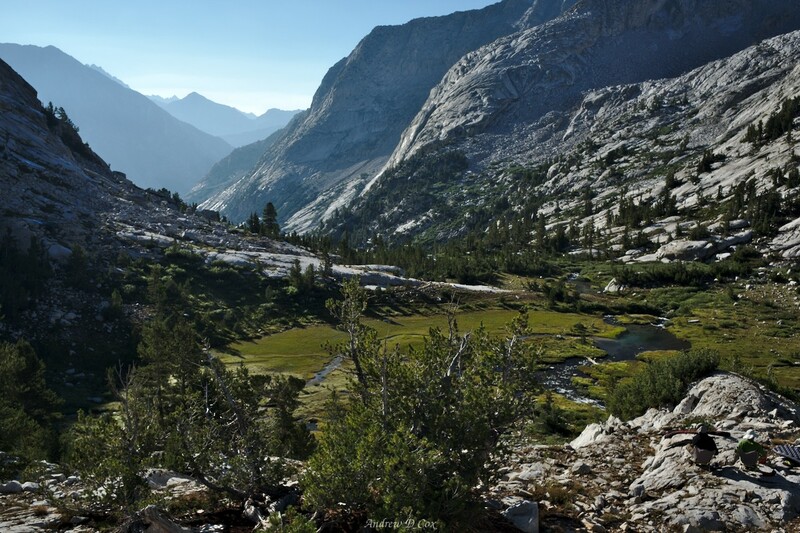 From Big Pete Meadow, I follow the John Muir Trail as it winds gradually up toward Muir Pass. For the first few miles, the terrain is similar to what I remember from last year on the JMT: sunny forests, the roaring river, and lots of rocky switchbacks. It’s a beautiful morning in Le Conte Canyon; see the two gents in lawn chairs admiring the views? However, as I climb higher, the similarities with last year’s hike grow fewer and far between. Where the land was covered by endless snow last year, there is endless rock this year. It’s like hiking a completely new trail with new scenery; everything looks so different! I’m soon above the treeline, striding through the barren wilderness below the Black Divide, a line of prominent peaks composed of dark, metamorphic rock rather than the usual silvery granite. In addition to the intriguing new landscapes, I’m enjoying fresh trail legs this morning. My body is beginning to adjust to the altitude and the strenuous activity, and my pack is significantly lighter since I’ve already eaten three days-worth of food. I cheerfully stride up the trail, climbing higher and higher into the wilderness. Helen Lake, which I think was almost completely covered in snow last year, glistens like a sapphire in the sunlight, encircled all around by silver granite slabs. I spot the Muir Hut just above me and am soon at the doorstep. The landscape is so different this year; the snow is gone and the rock is exposed! I don’t bother entering the hut – there’s not much to see in there, and it’s kind of stuffy. Instead, I take off my shoes and socks, sit down with my back against a comfortable rock, and relax outside in the sunshine. It’s high time for a snack, so I pull out a Cliff Builder Bar and munch away. I chat with several other hikers that are also taking breaks here atop the pass, learning their names and their hiking plans. 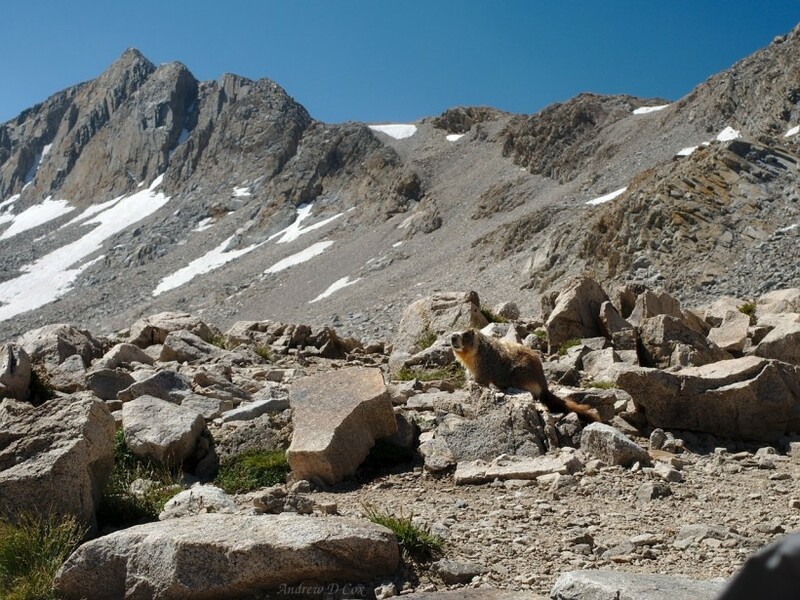 A marmot cautiously circles the group at a distance, hoping someone will drop a snack, but nobody does; calories are a precious commodity out here! After resting for a bit, I put my shoes back on and continue north on the JMT. I’m again blown away by just how different the scenery is! Lake McDermand and Wanda Lake lie nestled in the rocky, barren valley below the pass, completely free from snow and ice, a stark contrast to the ice sheets covering most of these beautiful lakes last August. Variety truly is the spice of life, particularly when life consists of walking all day long; I love to see different landscapes along the way! The north-bound descent from Muir Pass is long but incredibly shallow, for which I am grateful: I very much dislike long, steep descents. Lush grass grows along the trail in many places, watered by small creeks transporting snowmelt from the few snowfields tucked away below nearby peaks. I pass a few south-bound hikers and even a handful of people that are still lounging around their tents near Wanda Lake. 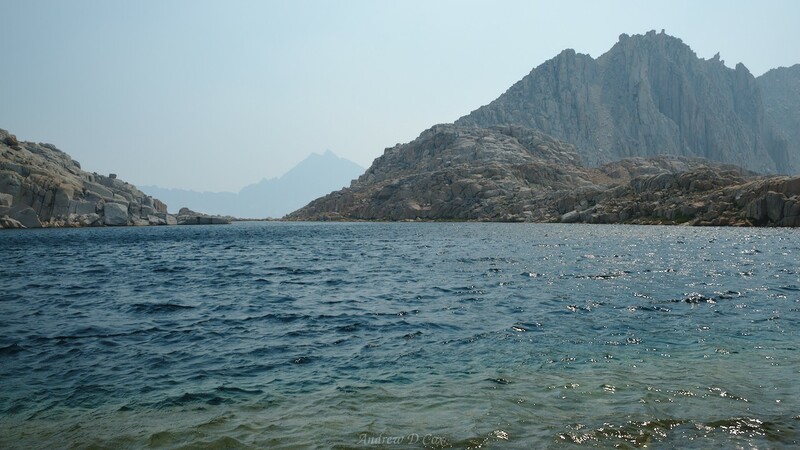 Around noon, I reach the beautiful Sapphire Lake and stop to eat lunch on a large slab of granite at the water’s edge. The ice-cold water feels great as I soak my feet while munching on peanut butter and dried fruit. I don’t pause for long beside Sapphire Lake because I’m still above treeline and it’s getting warm out here in the bright sunlight. One benefit of those stormy days is the shade supplied by all the fluffy clouds. On a cloudless day like today, there is no shade to be had. As I descend, the greenery intensifies and trees reappear. 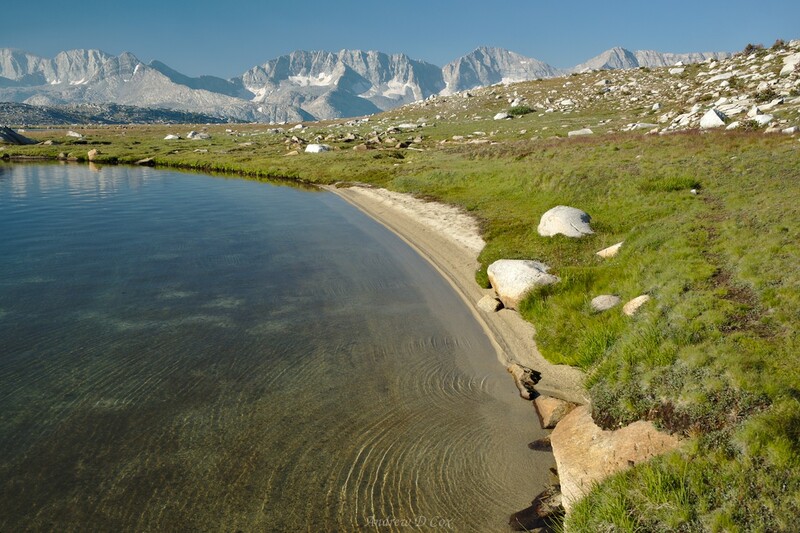 I soon reach Evolution Lake, considered by many to be one of the most beautiful spots on the John Muir Trail. I’m a little bummed to arrive at midday because I can’t possibly justify stopping here for the night. With the chance of afternoon storms near zero today, I would love to hang around and photograph the lake during the golden hour. Alas, not on this trip. The infamously beautiful Evolution Lake; too bad I’m not staying this time ’round! I work my way around the gorgeous alpine lake and am surprised to find absolutely nobody near the outlet where all the best campsites are. I suppose it’s too early to have arrived for the day and too late to still be packing up. 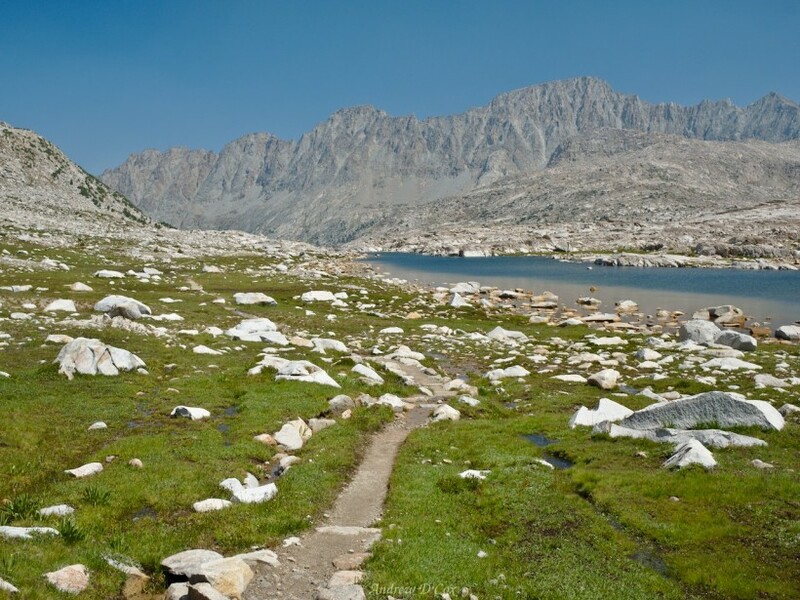 Beyond the outlet of the lake, I follow the JMT for a short distance and then leave the trail before it begins descending into Evolution Valley. 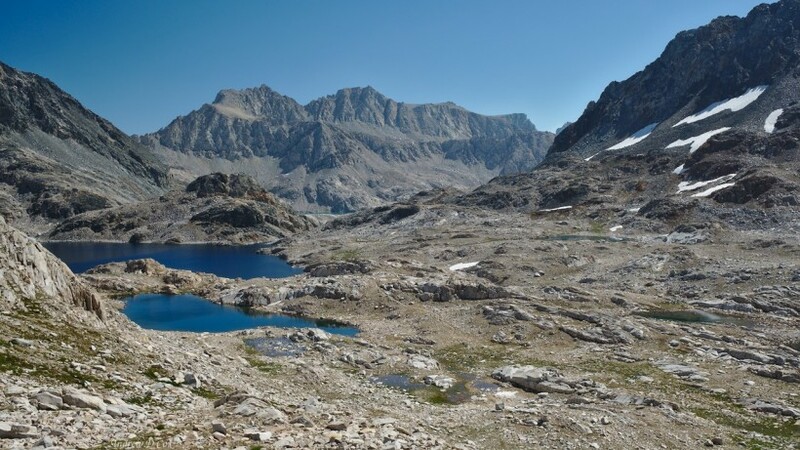 Here, the Sierra High Route diverges from the JMT for quite a while and I get to explore new sections of the mountains that I’ve never seen before! For the next three miles, Roper’s instructions are somewhat difficult to follow: contour across the top of the canyon by following wooded benches, remaining between two specific altitudes to avoid difficult granite drop-offs. I try my best to maintain a consistent altitude, but soon find myself faced with unassailable terrain. After climbing, descending, and backtracking to find the way forward, I give up on my no-GPS rule and pull out my phone to check my altitude. Sure enough, I’m below the altitude Roper suggests. After climbing up some steep gullies, I reach a more passable bench and continue onward. With the help of the GPS to keep me in the correct altitude corridor, I successfully navigate the several miles of wooded benches. 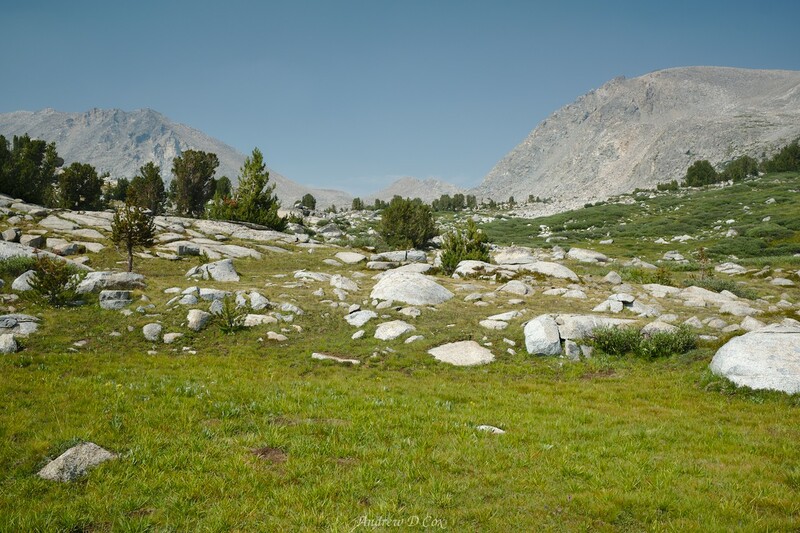 Somewhere above McClure Meadow, I turn uphill again climb through some marshy areas to drier, vibrantly green meadows. After the frustration of navigating the wooded benches, I’m happy to see endless open grassland in front of me! I put the GPS back in my pack and leave it there; following the map and compass is much more fun and engaging. I soon locate the next landmark on the Sierra High Route: Lake Frances, a massive lake hiding up here above Evolution Valley. 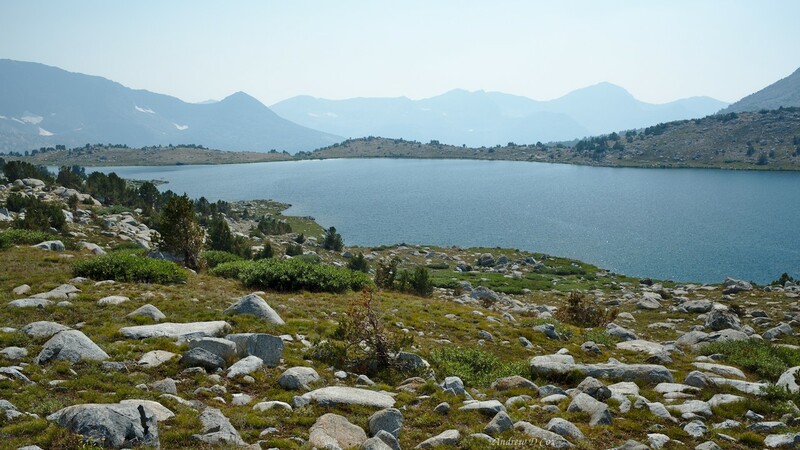 As I wander through the hilly terrain surrounding Lake Frances, I discover several other small ponds, twisted whitebark pines, and boulders scattered all around, the very definition of pristine Sierra Nevada wilderness. Free to choose my own path through the meadows, I walk along the lake until reaching one of several inlet creeks. 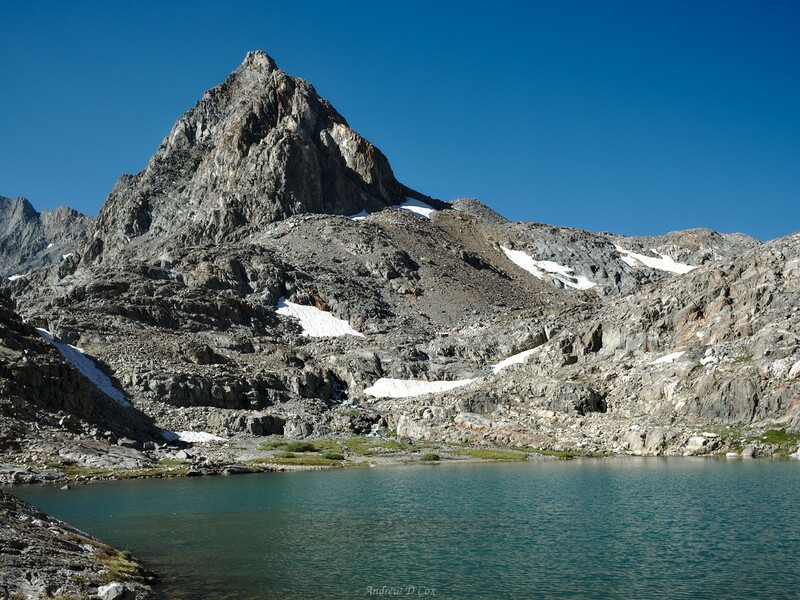 My next goal on the Sierra High Route, Frozen Tongue Pass, lies on the crest to the north, so uphill it is! As I gain altitude, I enjoy more expansive views of the lake and the peaks beyond. However, from this vantage point, a layer of smoke that obscures the surrounding landscape becomes obvious. Even the relatively nearby mountains on the Goddard Divide are light blue through the hazy air, a reminder that several wildfires are currently devouring forests near Yosemite, not too far northeast of here. High above Lake Frances, I reach a small tarn. After the technically easy but steep climb up the grassy hillsides, I’m ready for a rest. Plus, I should probably reapply sunscreen before making the final push to Snow-Tongue Pass; it doesn’t take very long to get a sunburn up here at 11,500′. After scrubbing sunscreen into my hands and neck, I sit for a few minutes and relax. A few birds hunt for bugs around the edge of the tarn, chirping as if telling their friends where the food is. Other than the cheerful birds, the only sound is the soft rustle of the wind brushing over the lake. The ascent to the pass, a distinct saddle between two gentle peaks, proves to be straightforward and I soon find myself on the ridge. The drop on the other side is much steeper than the terrain I just ascended and consists mostly of loose dirt and gravel. 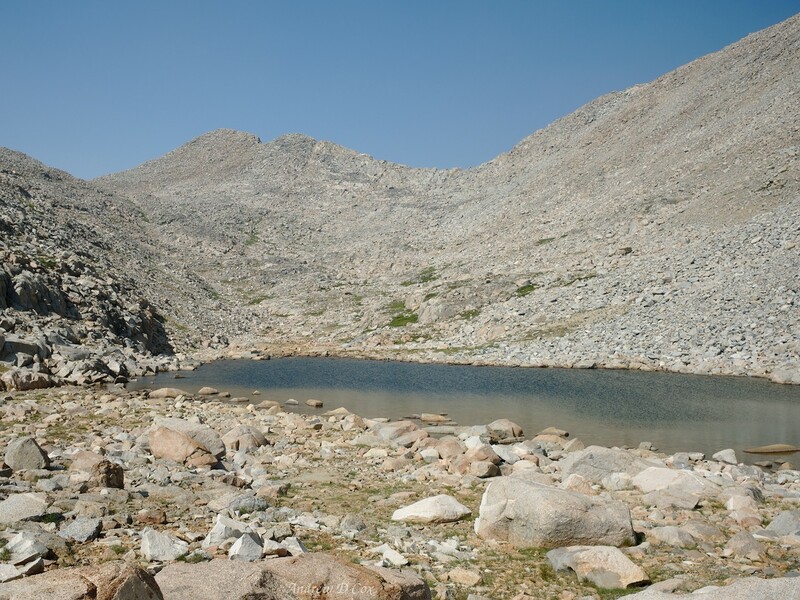 What a fun descent this is going to be… Beyond the precipitous drop at my feet, several lakes punctuate the barren landscape; I’m hoping to find a campsite near a pair named the Wahoo Lakes, mostly just because I like their name. 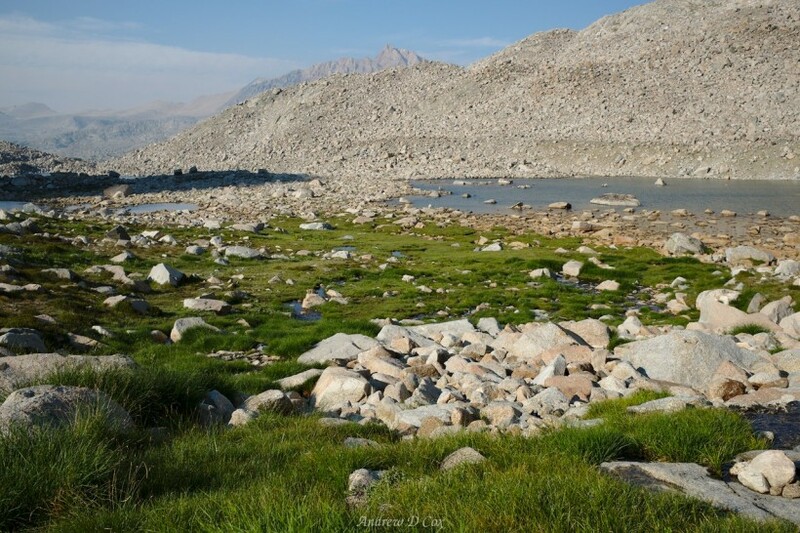 However, with a clear view of the rocky shoreline from up here, I realize that I’ll probably have to hike a little further and descend into Humphrey’s Basin to find someplace to pitch my tent. I tarry for a few minutes at the pass to reread Roper’s instructions for the next section of the Sierra High Route but eventually have to proceed. Clambering up the saddle a bit, I reach a slightly more stable slope and begin descending. Similar to Frozen Lake Pass, there’s no avoiding the slippery dirt and gravel, and I instigate a few small rock slides while working my way downhill. Rather than follow the steep use trail worn into the slope by previous High Route travelers, I stick to the edges of the slope and take advantage of protruding rocks as handholds. I make quick work of the rocky slopes and easily reach Wahoo Lakes. Sure enough, the shores are lined with piles of rocks, most of which are slanted at odd angles and offer no suitable sleeping locations. I might be able to go old school and “cowboy camp,” that is, put down my tarp and sleeping bag on a flat rock sans tent, but I’m afraid that I’ll be far too cold without the pocket of warm air the tent provides. The few small meadows near the lakes might be perfect for camping except for the innumerable creeks running through them and the fact that a soft, grassy meadow does not qualify as a durable surface for camping. With no camping options near the lakes, I move on. I’m beginning to feel a little low on sugar, so I pop some electrolyte tablets into my water and take a long drink. Over the past few days, I’ve discovered a fun reality: I don’t necessarily need to eat food all that frequently to keep hiking, but I do need carbohydrates and electrolytes. I can keep going on nothing but sugar water for hours, something to keep in mind for future long-distance hikes. By the time I reach a nice bench overlooking Humphrey’s Basin, my watch reads 7:00 and I’m very ready to stop walking. My body is exhausted and I’m pretty darn hungry. I find a good spot to camp, set up the tent, and cook dinner. Bundled up in my down jacket to keep off the chilly evening breeze, I sit out on a rock and eat while watching the sun dip lower and lower toward the horizon. Only last weekend I camped a mile or two below this spot with Daniel, Diane, and Josh. It’s fun to be back, particularly since I approached from such a radically different direction today! I stay out admiring the wilderness until darkness falls. It’s not very often that I find myself at a campsite that has such stellar sunset views! Mount Humphreys glows red with the last rays of light as the sun dips below the jagged western peaks. Then, the color on the mountain fades and the clouds turn gray. 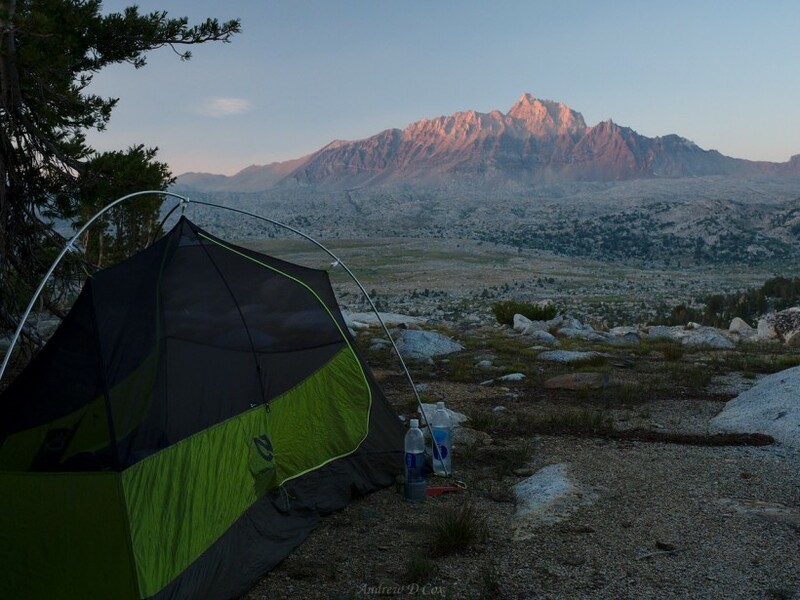 I return to the tent and happily crawl into my warm sleeping bag, thankful for such comfortable accommodations in this most beautiful of places. The views don’t get much better than this! I sleep fitfully throughout the night, mostly due to the cold temperature. A hot bowl of blueberry oatmeal rejuvenates me in the morning and I’m soon packed up and ready to do some more hiking. Since I’m up on the ridge overlooking Humphrey’s Basin, I spend a few minutes surveying the landscape, comparing it with my map, to figure out my location. 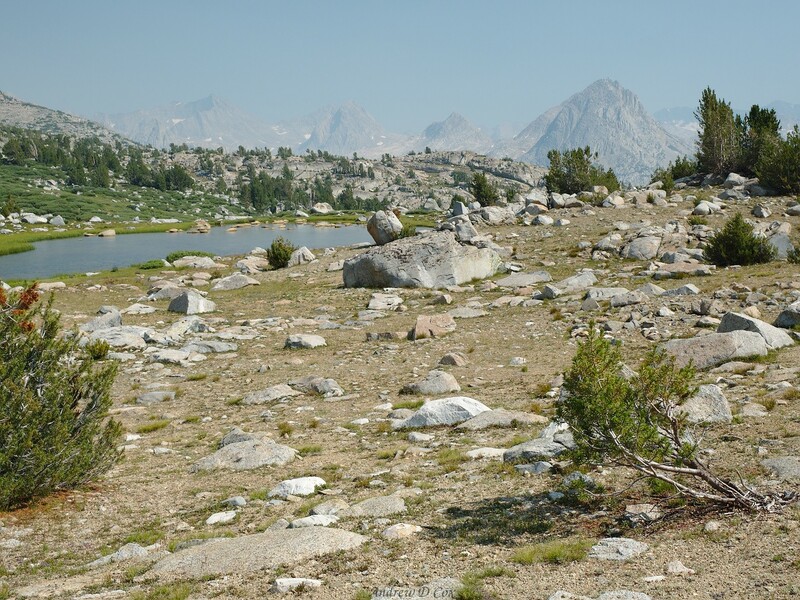 The next landmark on the Sierra High Route is Mesa Lake, out of sight behind the rollings hills in the distance. However, before making a beeline for that landmark, I have to descend into the basin, cross a medium-sized creek, and climb back up to the meadows beyond. The descent doesn’t take long as I quickly identify routes through the talus and willows to the spongy meadows on the valley floor. The air remains brisk in the shaded valley and I keep my jacket on for a while to stay warm. By the time I reach the trail, the sun has climbed higher and I’m feeling warm enough to stash the jacket. From here, my path is less certain. Mesa Lake is still hidden behind several lines of undulating hills so I rely on the compass to navigate. 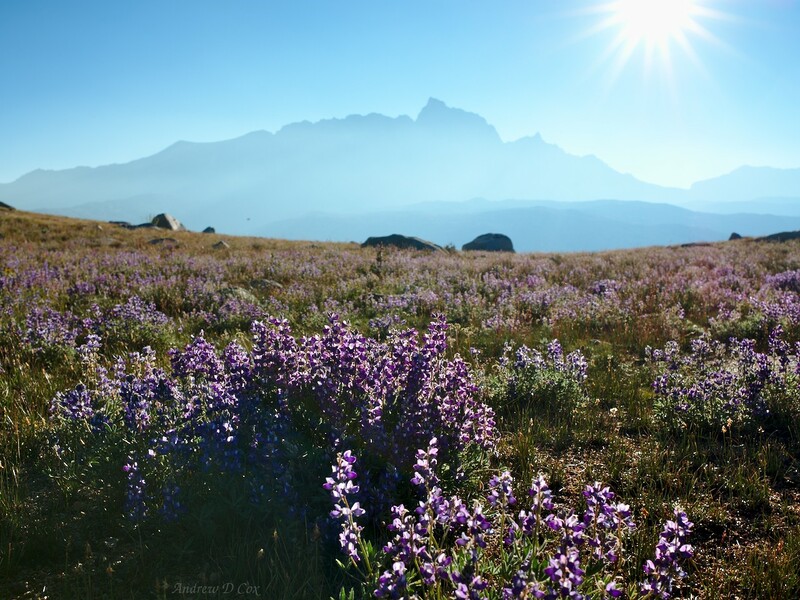 I appreciate the easy walking through meadows full of lupine and other wildflowers. However, I’m disappointed to see that Mount Humphreys is obscured by smoke; only the silhouette of the majestic peak is clear. As I continue through the rolling hills of Humphrey’s Basin, I begin to notice an odd feeling in my lungs, sort of a burning, chalk-like congestion. 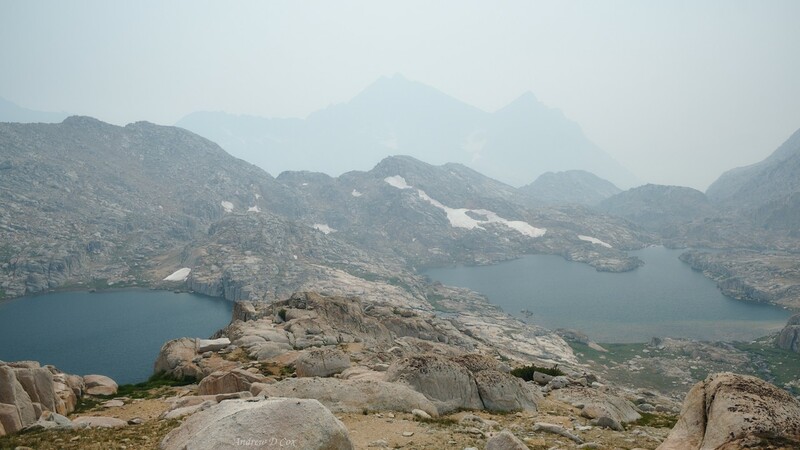 With haze obscuring many of the surrounding peaks, I soon realize that I’m breathing in smoke; if you’ve ever accidentally inhaled smoke while sitting next to a campfire, you’ll know the feeling. However, in contrast to a campfire, I can’t just move away from the smoke and breath cleaner air. The pollution permeates the air for miles around. I figure staying put and waiting it out isn’t an option, so I soak my bandana with water from one of my bottles and tie it around my nose and mouth. Almost immediately, I notice a difference; I can’t smell/taste the smoke anymore! With my makeshift air filter in place, I continue through the meadows looking like some sort of backpacking bandit. I soon notice that, while the bandana keeps the smoke out, it also keeps the hot, moist air I exhale in. For now, I’m willing to trade clean air for some extra heat and humidity. Over the next mile or two, I enjoy the process of navigation through the relatively featureless landscape: find a tree or rock in line with the compass heading, walk to it, find another tree in line with the heading, walk to it, etc. Upon cresting yet another hill, I finally catch sight of Mesa Lake and experience a surge of pride. I’ve navigated straight to it! Now with plenty of landmarks to follow, I quit orienteering and walk down to the lake. The crystal clear water sparkles in the morning sun, and my feet sink softly into the spongy turf as I follow a use trail that skirts the shore. A small, sandy beach grabs my attention; what a perfect little piece of paradise! Who ever said you can’t lounge on a sandy beach and simultaneously enjoy majestic mountain landscapes? 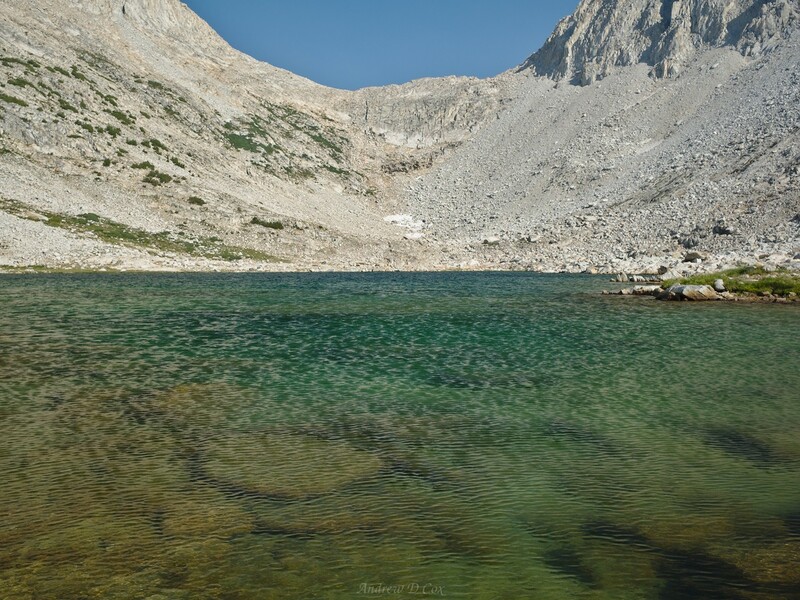 At the far edge of the lake, I begin ascending a steep, grassy chute toward Puppet Pass. I’m still breathing through the bandana, but the hot exhalations, steep climb, and reduced oxygen content conspire to make the hike difficult for me. Partway up the chute, I take off the bandana; the smoky air is the lesser of the discomforts for now. 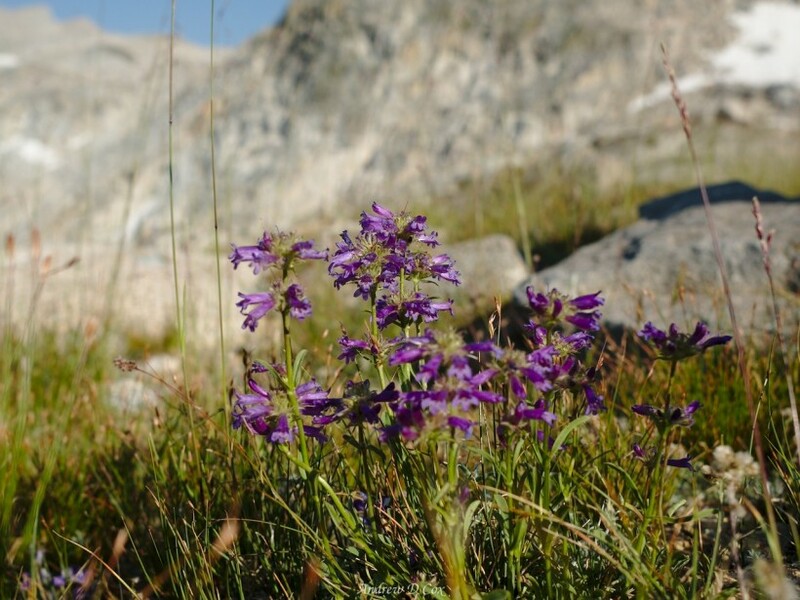 Over the next 30 minutes, I climb through the grass to rockier, more tundra-like terrain, and then even higher to the beautiful, barren wilds atop Puppet Pass. Up here, the entire world is cold stone. While the views behind me aren’t too inspiring due to the haze, the small bench west of Puppet Pass looks incredible! 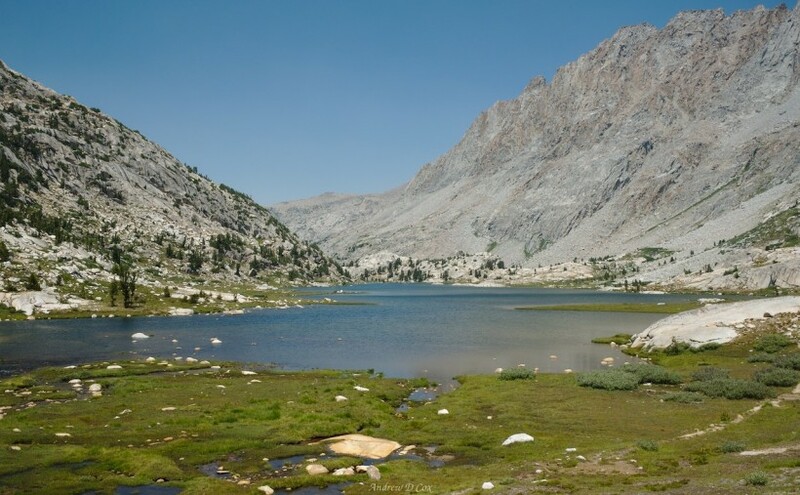 At least five separate lakes dot the landscape between here and French Canyon. Beyond the canyon, a dozen peaks stand shrouded in more smoke. I’ll be trekking through those mountains later today, but first things first: I need to descend from this pass. Although I didn’t have much trouble walking up the gentle terrain east of Puppet Pass, the west side – my descent – is significantly steeper. In fact, “vertical” is a fair description of the talus slope. However, as with most seemingly impossible traverses, you just take things one boulder at a time. Slowly, carefully, I pick my way down the talus. Some of the rocks are as large as a car! At least going downhill grants me a view of the terrain below and I can pick out the least precarious routes. I eventually reach the bottom of the pass and set off across the more level terrain toward Puppet Lake. Along the way, I pass a family with several young kids out sliding down a short snowfield. Even out here, off the trail, I run into other adventurers, although far fewer than I would see on the trail! On the far side of Puppet Lake, a steep slope descends to another bench with Elba Lake tucked between drop-offs. I make quick work of the descent and then stride through grassy meadows to the trees that line canyon rim to the west. Following the map, I trend northward to find the shallowest path into French Canyon. The final descent to the canyon floor is steep but I enjoy bounding through the dense willows, wildflowers, and pine trees. A short while later I arrive at the creek running through the bottom of French Canyon and cross it. On the opposite bank, I pick up the Pine Creek Pass Trail and head downhill. Partway down the canyon, I realize that the smoky air seems to have cleared; I can’t feel it in my lungs anymore! Having walked this way last weekend, I disregard Roper’s instructions to leave the trail north of the Merriam Lake outlet and instead cross the cascading creek to the established Merriam Creek Trail just south of the outlet; there’s a little signpost marking the route. Hungry and tired, I take a break at the junction to eat a snack and soak my feet in the creek. After eating and resting, I reluctantly re-shoulder my pack and begin climbing the steep trail to Merriam Lake. The hot sun streams through the pines and I’m soon dripping sweat. My strategy for this kind of challenge is simple: I settle into a rhythm of small, quick steps and rely on my long-distance running training to maintain the effort. In no time at all I reach more level terrain; the forest gives way to lush meadows through which the Merriam Lake outlet creek meanders. 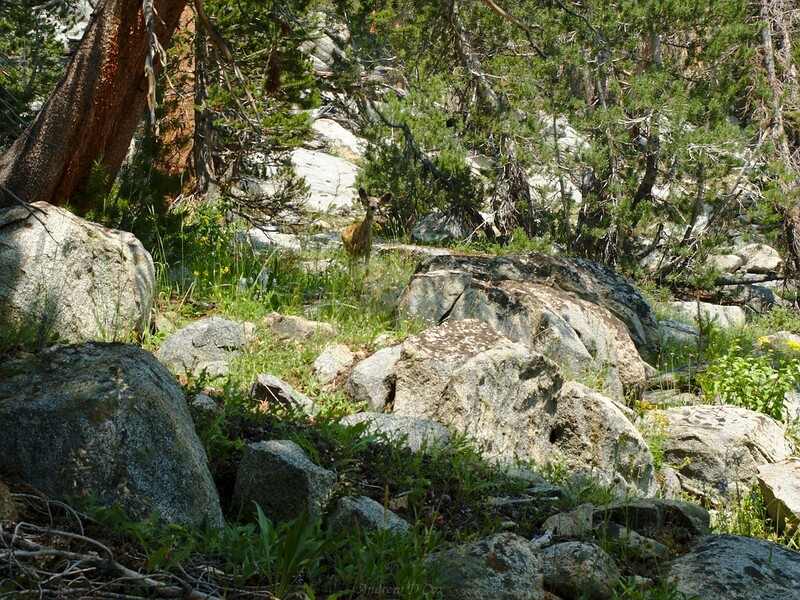 The trail grows faint here as it winds through the long grass and over slabs of granite. Roper’s instructions prove useful here, so I give up on following the trail and instead navigate via landmarks. Along the way, I meet a couple that are spending a few days in this beautiful locale. “Once we started hiking cross-country, we never went back [to exclusively on-trail travel],” they tell me. I can see why! There are so many beautiful spots to discover off of from the beaten path; why constrain yourself to the trail the entire time? 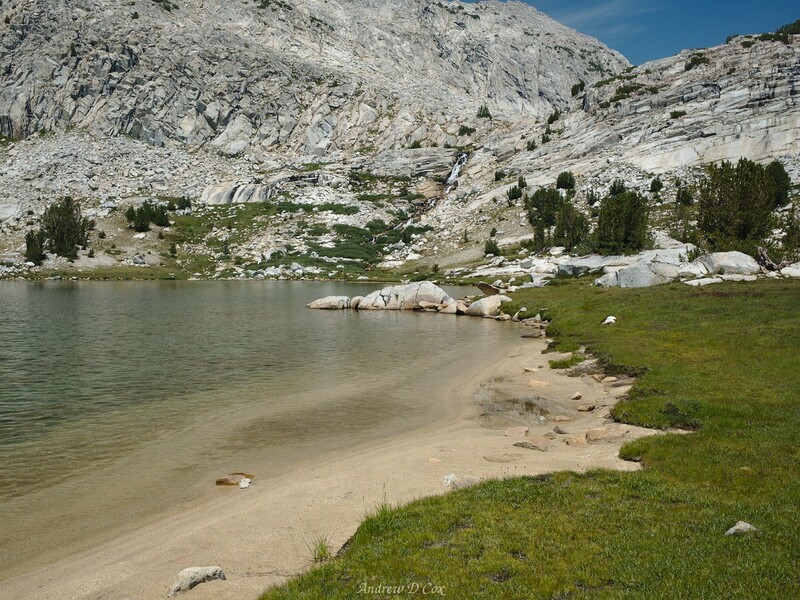 I stride past another beautiful alpine beach; this one has a nice cascade feeding the lake! I finally reach Merriam Lake and discover some more sandy beaches, this time with granite cliffs and an impressive cascade in the background. I contemplate stopping here for lunch but decide to continue a little further; I’m not hungry yet, and the map shows several more lakes higher up the valley. Although the cliffs near the cascade appear untraversable, closer inspection reveals plenty of ways to scramble up, so scramble up I do. At the top, a long, narrow valley stretches into the distance, terminating at the Sierra crest where Feather Peak and Royce Peak tower over the landscape. Navigating this pleasant landscape proves easy enough, at least for a little while. I pause next to a long, shallow lake around noon and decide to go for a swim. I don’t stay in the water for long, however; it’s icy cold and I’m not hot enough to need a cool down. After swimming, I drape my clothes over nearby rocks and eat lunch while waiting for them to dry. 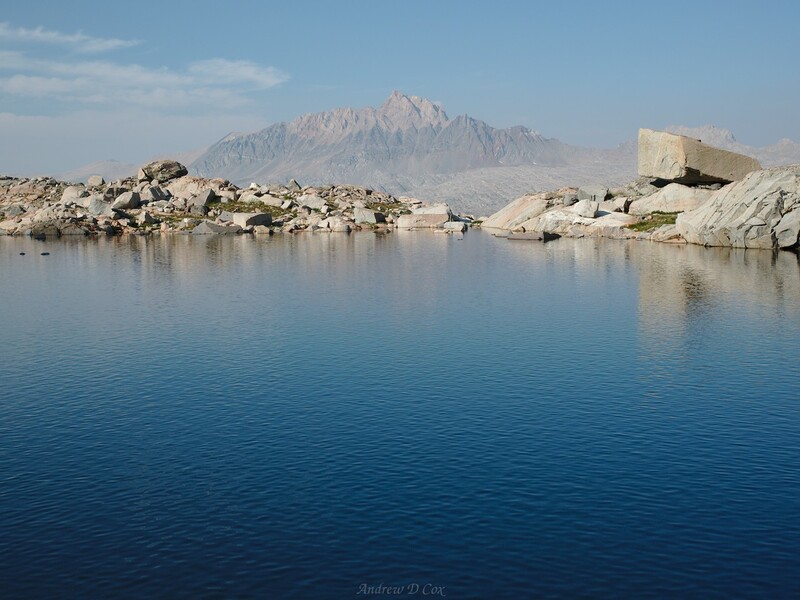 To reach the largest and final lake in this valley, I clamber up granite slabs for a few hundred feet. Several large snow fields line the lake, forcing me to navigate around them. At the end of the lake, several chutes cut through a steep cliff and provide access to the top. There doesn’t seem to be a right or wrong way to go, so I pick the closest chute and scramble on up. 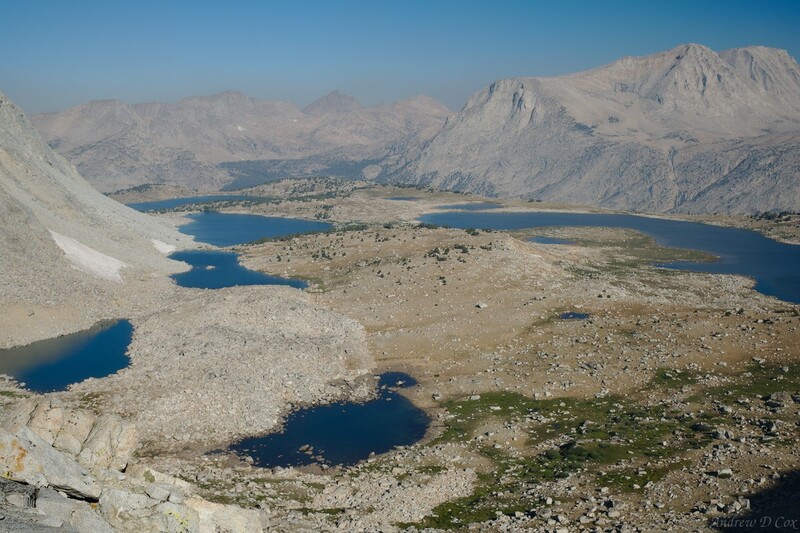 From the top of the cliff, I simply hike up granite slabs toward Feather Pass, an obvious saddle south of Feather Peak. I’m excited for the next several miles, a complex wilderness dotted with several dozen lakes, all with bear-related names. 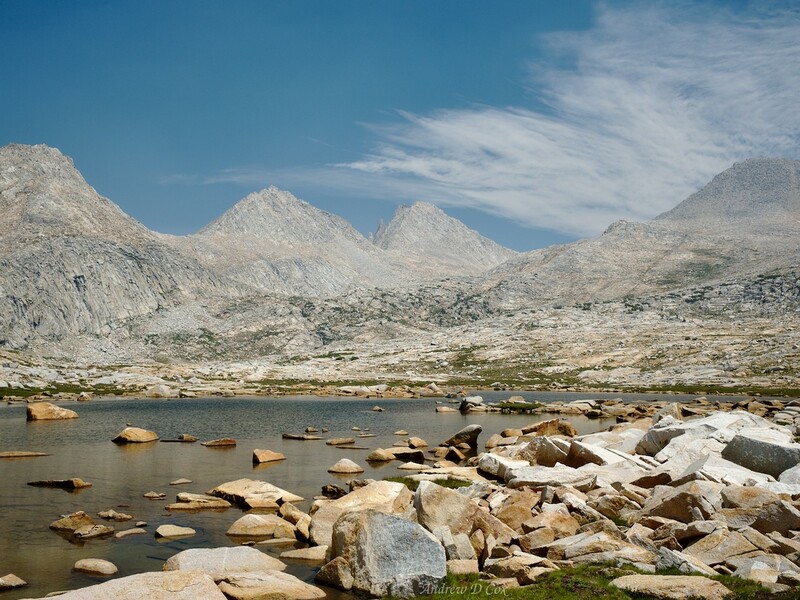 Rumor has it that this area is one of the most beautiful in the Sierra Nevada so I can’t wait to see it myself. When I reach Feather Pass, panting from the steep climb at this high elevation, I’m incredibly disappointed to find the entire landscape before me shrouded in smoke. In addition to the unimpressive view, I’m frustrated at the prospect of having to hike with burning lungs again. This can’t possibly be healthy. 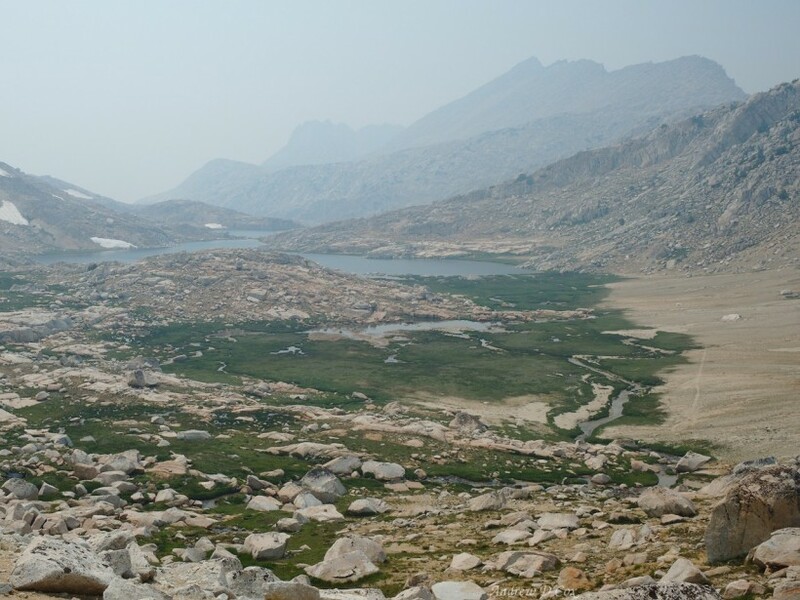 Sighing, I tie the bandana back around my face, and begin an easy descent into the “Bear Valley.” I’m sure I would be awed by this wilderness on a better day, but I’m not feeling it today, what with the haze and the smell and burning lungs. 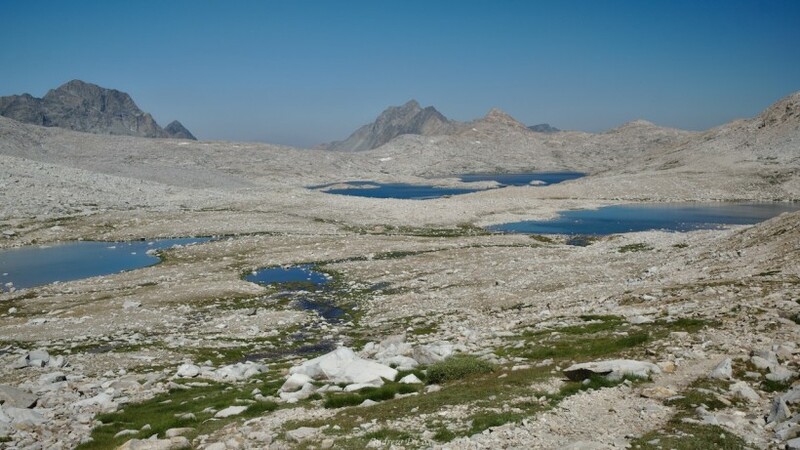 How many miles of the Sierra High Route are going to be like this, with every peak and valley more than a mile away completely hidden from view? Should I cut my losses and hike out at the next pass? Questions and doubts tumble through my head as I walk to Bearpaw Lake. Following Roper’s instructions, I navigate around Bearpaw Lake to Ursa Lake, up a chute to a small valley that contains Black Bear Lake. Of the ridge above Ursa Lake, Roper proclaims, “the panorama … is perhaps unmatched on the entire High Route.” Some panorama… all I can see is a few faint silhouettes of the closest peaks. Irritated, I continue upward. 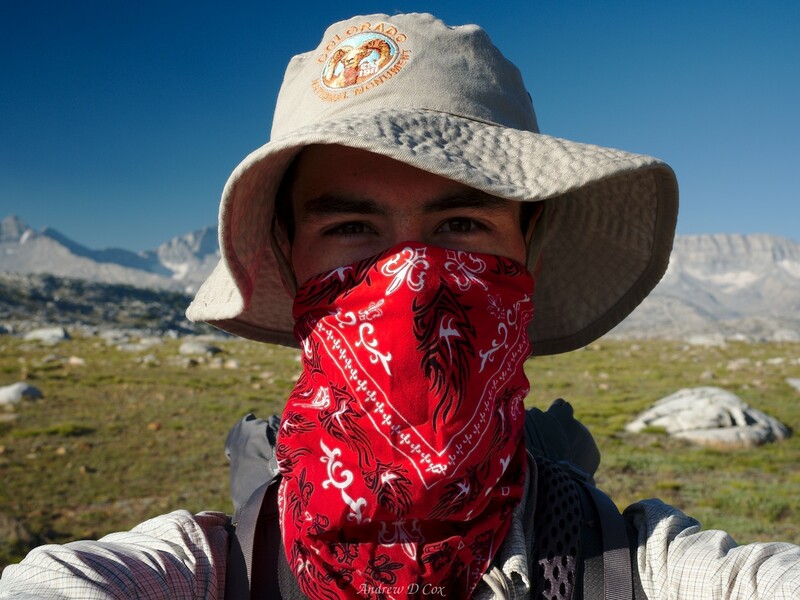 To climb the steep terrain, I have to take off the bandana to get enough air and subsequently fill my lungs with smoke. I pull the bandana back on when I pause for breaks, but it’s not a very satisfying compromise. Past Black Bear Lake, I scramble higher to White Bear Lake, a lonely lake located right on the ridge crest. A stiff wind howls through the rocky landscape and whips the lake’s surface into lines of waves. I work my way around the eastern shore to the northwest side of the lake and then climb up a short mound of rocks. This minuscule climb brings me to the top of White Bear Pass. From this side, “pass” seems like a joke of a term; the lake is only 10 feet below! However, the opposite side of the pass drops over 1,000′ to Brown Bear Lake. 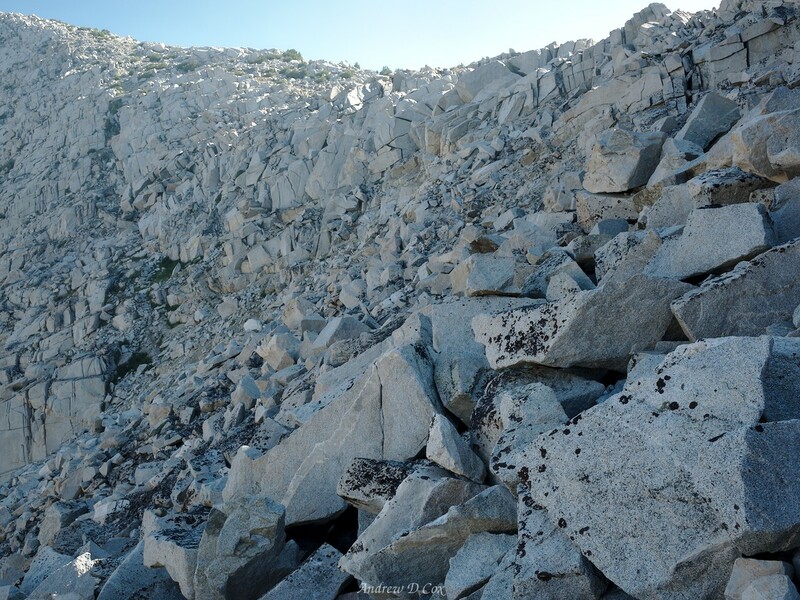 I follow the Sierra High Route instructions and keep to the right as I carefully scramble down the steep granite ramps. Something like an hour later, I reach level ground at the shore of the lake and look back at the pass. From here, the climb looks completely impassible, a sheer wall of granite. Then again, every climb looks steeper from a distance than it truly is. The stiff wind whips the water of Brown Bear Lake; beyond the water, check out steep White Bear Pass! I had hoped that the wind would be less ferocious down here at the lake, but it seems even fiercer than it was up atop the pass. Thankfully, I find a wonderful sandy spot not far from the lake where I can pitch my tent. Although it’s only 4:30, I’m well ahead of schedule and can afford to stop early, particularly since I walked until 7 pm last night. So, I set up the tent, taking care to point the narrower end into the breeze. Once it’s securely guyed out, I crawl inside, leaving the doors open, and relax for a while. 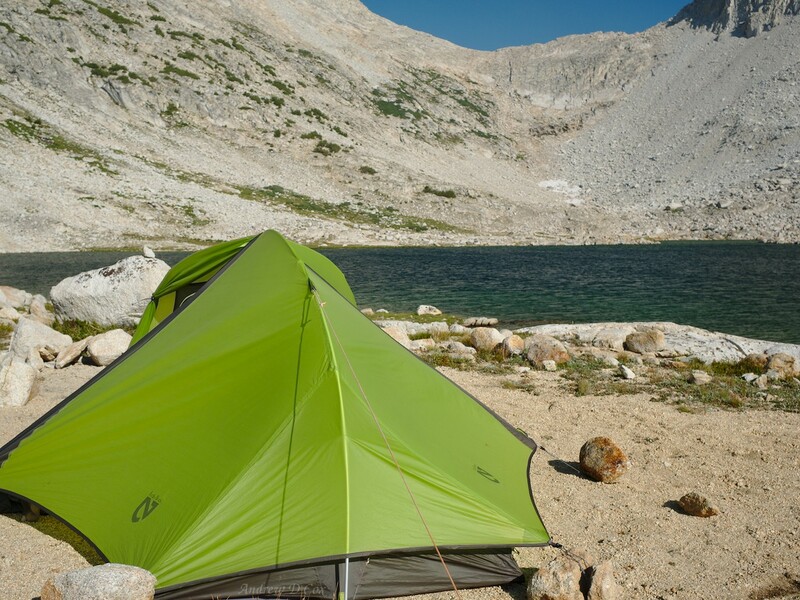 The wind whips around the tent but not into it, leaving the interior surprisingly warm and cozy! I take advantage of the shelter to jot down notes from the day and read about the terrain I’ll be traversing tomorrow. With the tent securely guyed out, I have a place to hide from the wind; it’s surprisingly warm inside! Later in the evening I cook and eat dinner, and then hobble around the lake on stiff legs with my camera. I can no longer smell the smoke, which is nice for breathing purposes, but many of the distant peaks are still completely obscured. I’m disappointed that I wasn’t able to see the epic panoramas from earlier in the day, but I suppose that means I’ll just have to come back and hike this section again. After exploring the area for a little while, I return to the warm confines of the tent and go to bed.